These maps date from 1808 to 1930. I find them interesting because they reveal the relative isolation of the Nehalem Bay area -- isolation from Astoria and places north and from Portland and the Willamette Valley. 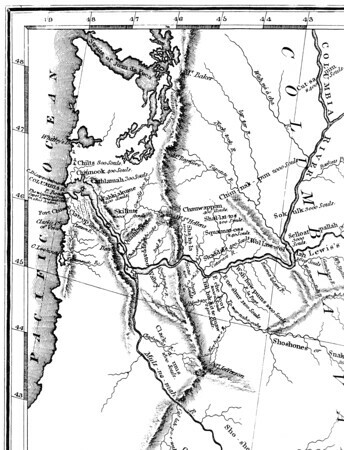 The map of the northwest based on reports by Lewis and Clark showed detail around the mouth of the Columbia, but only a vague idea of territory south of Tillamook head. 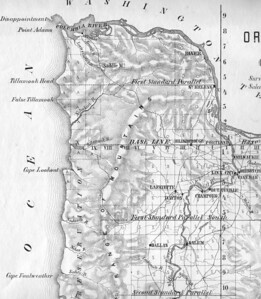 By 1870 surveyors had worked around Tillamook Bay and south of Tillamook Head into today's Cannon Beach. By this time, the Indian reservation was far smaller than shown on this map. 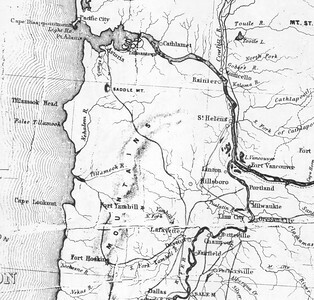 The wagon road from Tillamook into the Willamette Valley followed the Trask River into the coast mountains. Surveyors would visit the area around Nehalem Bay during the next ten years. Throughout the 1920s business interests in Portland and along the coast lobbied for new roads. This 1930 map shows empty spaces now occupied by Highways 26 and 6. 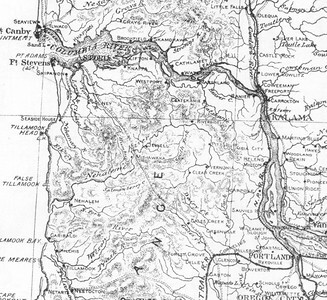 Highway 26, known as Wolf Creek route, won the competition for short route to the coast. Highway 6, the Wilson River Road, had been a wagon road in the 19th century. State officials upgraded the roadbed in the 1930s to allow salvage logging of the Tillamook Burn. In 1846, Great Britian and the United States agreed on the 49th parallel as the northern boundery of the U S west of the Rockies. 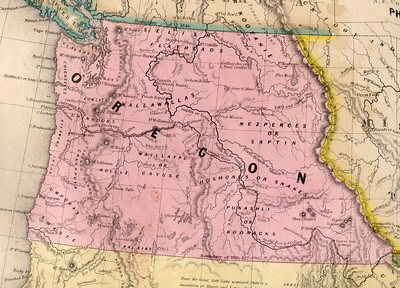 The Oregon country included the modern states of Oregon, Washington and Idaho. Surveyors in the 1870s identified properties already owned and mapped the area ready for the homesteaders to follow during the next 20 years. 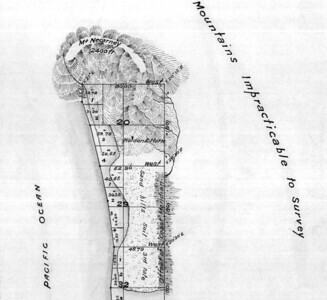 By 1855 maps showed more detail along the coast. Rivers, bays and headlands appear somewhat accurately -- although the Nehalem River estuary has not yet been explored. By 1881 the geography of the north coast was clearly established. Towns and rivers have locations and names familiar today. 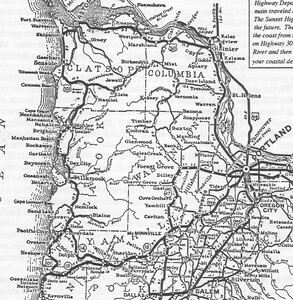 This map from 1859 shows the military road planned from Astoria into the Willamette Valley. At the north end, the road never made it past Saddle Mountain. 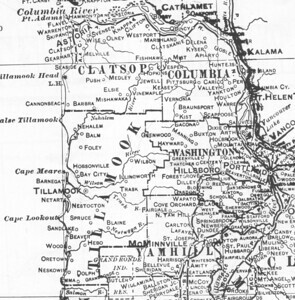 In 1900, map makers could draw county lines and locate logging camps. A road -- today's Miami/Foley Road -- reached from Tillamook into the Nehalem Valley. Nehalem is an established town, but Wheeler and Manzanita lie ten years in the future. 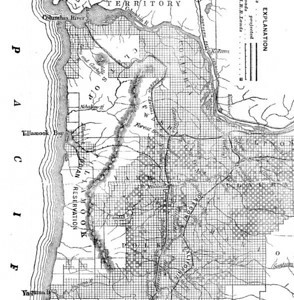 White settlers began arriving around Tillamook Bay in the 1850s. 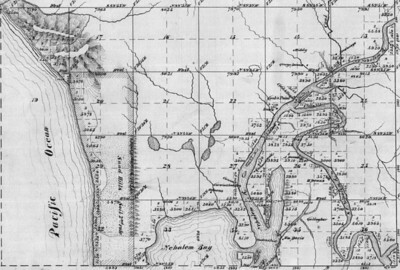 In 1856, the first surveyors mapped the Necarney (Neahkahnie) Mountian and the area known today as Manzanita. The early 1920s brought automobile tourism to the coast. 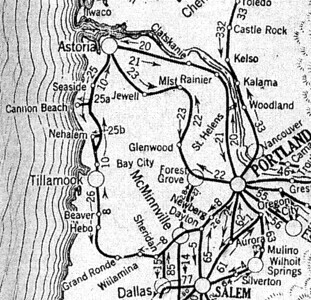 The loop tour shown here relies on today's Highway 30 to Astoria, 101 to Seaside, 26 to Necanicum Junction, 53 to Miami/Foley, 101 to Hebo, 22 to Grande Ronde, and 18 back to Portland. The length of this route added to calls for a short route to the coast.